Yoga is wildly gaining popularity all over the world- not just for fitness, but for its many, many health benefits. One of its lesser known benefits: Yoga works wonders for hair! So if you want thick and healthy hair, it’s time to make friends with Yoga. Yoga helps with overall blood circulation. Any posture which increases the supply of blood to the head area, impacts the health of hair. 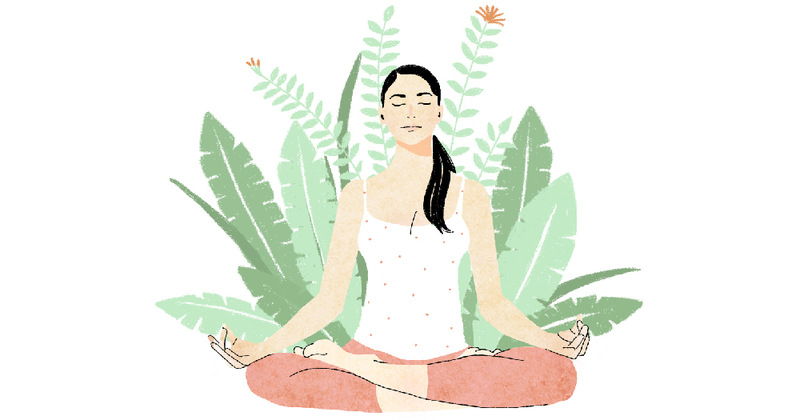 Specific Yogic techniques that do so, enhance the lustre, quality and thickness of hair. The classic posture, Sirsasana is great for this(Psst.. it was a favourite for young princesses too). However, a simplified version of this can be well within the reach of beginners....Pranamasana. Sarvangasana, Vipereeta Karani Mudra also have a similar impact to a lesser extent. 10 minutes of Sarvangasana each day followed with Halasana can prevent hair fall and enhance the quality to give you visibly stronger and lustrous hair. Another great posture is Padahastasana. Glowing skin, lustrous hair, ageless beauty can be yours with regular and correct practice. The most important practice is Surya Namaskar- when done with awareness of the Chakras and the right breathing, it directly impacts the optimum flow of glandular secretions. 5 to 7 rounds of the Dynamic Flow followed by Shavasana is the best work-out! It de-stresses and creates a pulsation of life into our very cells. Stress takes a toll on hair, along with the rest of your body and Yoga is your remedy. Breathing techniques which balance the flow of the Ida and Pingala Nadis automatically give a sense of equanimity. The practices have to be scientifically planned as per individual needs, Nadi Shodhan Pranayama, Sheetali Pranayama amongst others work to calm the mind hence calming the internal systems and getting in sync with the biorhythms of Nature. Kapalbhati and Bhastrika detoxify and create tremendous energy, and achieves the real agenda- Pranic Flow. Needless to say, it is important to do these right. Practice these yogic asanas under the supervision of a qualified yoga instructor so that you get breathing, stability in posture, one's own level and capacity and knowing the impact of each movement as it flows from one to the other- unwinding, rejuvenating and restructuring your very thought process. Once you join the Yoga bandwagon, no one can stop you from have flowing, lustrous hair. So, hop on! Suman Bhatia is an accomplished Yoga exponent who has been imparting her wisdom since 1996. Trained in Rishi Patanjali’s Ashtanga Yoga under the aegis of Bihar School of Yoga, Munger, she approaches Yoga as a unified discipline, aiding in the holistic development of body, mind and soul. In the past, she has also drawn from her knowledge to conduct workshops in Health & Stress Management and Persona Enhancement for corporates.